When I go grocery shopping, I tend to go to a few different stores, sometimes as many as four! 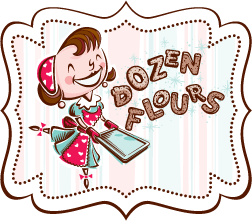 I know, I'm nuts but it's just something I do because I'm picky about the food I buy, especially when it comes to produce and baking supplies. There is one grocery store that I shop at because they have a great assortment of bulk foods and spices. For those of you in the Seattle area that are curious, it's Central Market. While I was there getting a few things a few weeks ago, I was looking through all the bins for nothing in particular and stumbled upon Medjool dates. 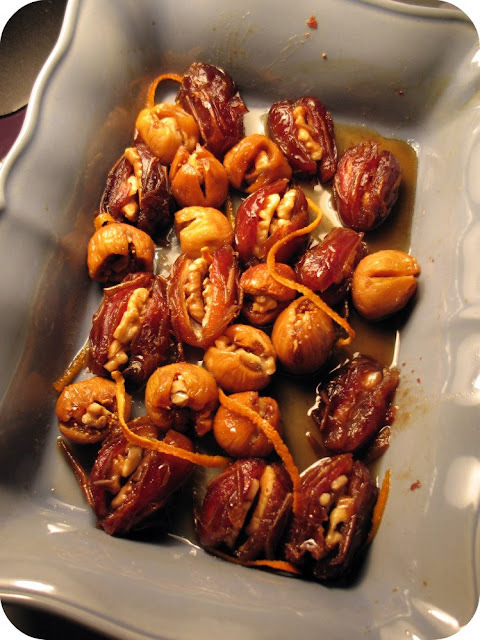 I had only had dates a few times in my life and had never been much of a fan as they were always dry and grainy. 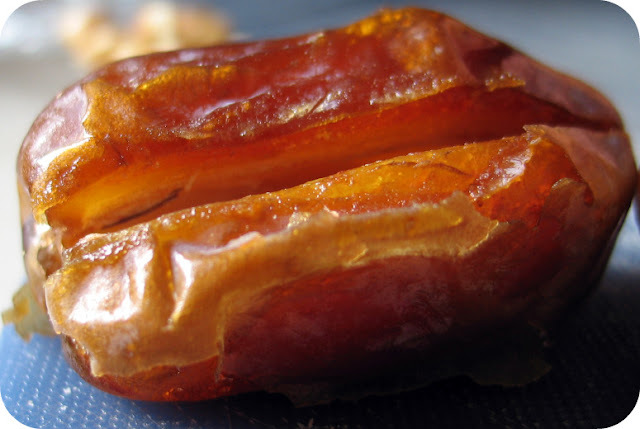 However these dates were plump, shiny, and looked to be bursting with flavor. I decided to be brave and try one and boy was I glad I did. They are SO good! 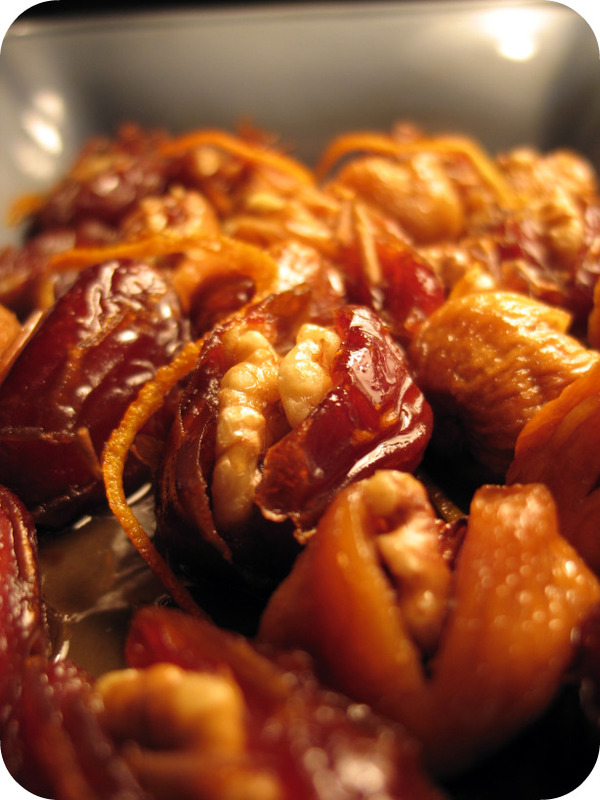 Not only are dates delicious, they are really good for you too. Dates are low in calories (around 24 in each one) and have more potassium than a banana. They are also high in fiber and have no sodium or cholesterol. I've been so coo-coo for Medjool dates that when I found a recipe that called for Calimyrna figs, I subconsciously substituted them for dates. I even wrote down "Calimyrna Figs" on my grocery list and it wasn't until I was standing in front of the Medjool date bin at the store did I realize my error. The idea of not using the dates made me a little sad (I had my heart set on it!) so I decided I'd make the recipe with both. It worked out perfectly. I made this for an apartment-warming party and everyone liked them a lot. I only wished I had made them with Agave or maple syrup so that the vegans in attendance could have enjoyed them too. For some reason I can never remember that honey isn't vegan! Yield: Several! 10 to 20? Its one of those thing you just nosh on. Pour the grape juice into a small sauce pan and simmer on a low boil for about 1/2 hour, until it reduces by half. While the grape juice is reducing, preheat the oven to 325F and position the wrack in the center. Before I explain the steps for preparing the fruit, keep in mind the goal is to make a pocket to hold the nuts. Be careful not to cut through the fig or date or to cut the pouches too big. You can always make it bigger when it's time to stuff it with a nut. Remove the stems from the dates and with a sharp paring knife, along one side, cut a slit from the top to the bottom of the date, until you reach the center. Remove the pit and set the date aside. Repeat with all of the dates. Set aside. Remove the stems from the figs. Hold the fig so the bottom is down on the cutting board. With a sharp paring knife, make a vertical slit along the top and down through the side, but be careful not to cut it all the way through. Set aside. Insert one or two walnut halves into the fruit. You can use your finger to hollow out the inside of the date, if needed. Be careful not to puncture the skin on the opposite side of the fruit. Close the slit over the nuts, if you can. To stuff the figs, use 3 or 4 walnut halves to stuff the larger ones and one or a few broken pieces to stuff the smaller ones. There's really no right or wrong way to do it. The main goal with both fruits is to avoid over stuffing them so that the break. If that happens, just put them fruit-side-up in the baking dish. Place the fruit in a smallish sized baking dish, nut side up, leaving a little room in between each piece. Pour the reduced grape juice over the fruit and drizzle the honey over the top of the fruit. Add the orange zest to the pan. Bake the figs uncovered for 20 minutes. Turn them once and bast them with the juices. Return them to the oven and bake them for 15 minutes and baste. Bake for an additional 15 minutes. Remove the figs from the oven and allow to cool completely on a wire rack. When they have cooled you can store them in an airtight container at room temperature for up to 2 weeks. They can also be served warm out of the oven. Serving tip: They go great when paired with salty cheese like aged provolone or feta. mmmm. i love dates. the stuffing sounds amazing! I love figs and dates, but have never had a stuffed version. These look and sound incredible! Thanks for sharing Julia, and your pictures are never bad! These would be a fantastic starter to an evening. I hear you about bad pictures and digital cameras deciding to give up the ghost. These look amazing! I've just recently come around to medjool dates, too! They're totally fantastic. I can't wait to try out this recipe!! Julia- This sounds amazingly delicious. I am so glad I found you through Ingrid. I look forward to all these posts.. I am making that snickerdoodle bundt this weekend.. You have so much awesome stuff on here.. I have told you before.. and this recipe is right up there. Looks great! Sounds wonderful! I've ever tried figs or dates. This looks like a recipe that would win over the haters! That's funny you hid 'em in the trunk! I've nere had stuffed dates, these look very very good!